Appearance: Golden yellow with a slight orange tint. Cloudy. Fluffy, half inch head that dissipates slowly. Moderate lacing left on the glass. Aroma: Lemon zest. Yeast. Clove and other spices. Taste: Well carbonated. Has that Champagne fizziness that is typical of the style. Creamy texture. Starts off with lots of citrus. Tart with moderate hop bitterness. Dry, spicy finish. I am a huge fan of the delightfully funky Saison beer style! 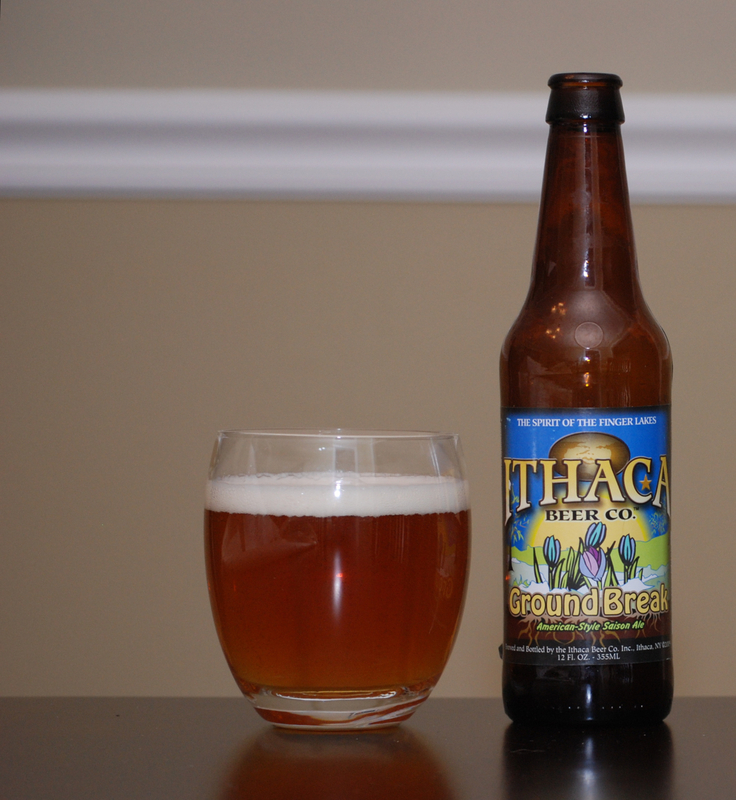 While the Ithaca Ground Break Saison isn’t the best Saison that I’ve ever had (Goose Island Sofie and Saison Dupont are my favorites so far), it’s still a very good example of this beer style (it’s also much less expensive than my two current favorites). Though I drank this beer on it’s own the other night, it craves to be paired with food, particularly rich, creamy cheeses, and charcuterie. Gonna have to put that pairing on my already long to-do list. So I’m minding my own business (well, not exactly my own – my work’s business) and moving slowly towards a reasonably productive stretch when out of the corner of my ear comes the telltale *ding indicating a new e-mail…. Ah, a new beer review from one of the BoozeDancers – G-Lo. OK, having been somewhat responsible for introducing him to the dark and delightful world of craft beer obsessiveness, I’m willing to allow a short distraction and read the review. I’m nearing the end and then, to my astonishment, horror and visceral disgust I see not one but two highly offensive inclusions – yes, “inclusions” – just like the dirty little specs of black carbon that ruin real diamonds and forever earn them the title “Zales Diamond”. These inclusions; however, are not specks of carbon but are, instead, claimed by some to be edible foods. OFFENDER #1: “rich, creamy cheeses”. Only things worse than seeing the words are seeing the offal encased in pretzel dough surrounding a hot dog, and; having the insidious rotting milk injected into an unsuspecting virginal hot dog itself. OFFENDER #2: “charcuterie” What does this even mean? I nearly passed out at the thought of it. I know that Tria does a nice business of pairing these offensive and freakish things with wine (and allegedly with beer) but they’re preying on the unevolved (for the record, I’m a big fan of their’s despite their association with the cheese-afflicted). Charcuterie (pronounced /ʃɑrˌkuːtəˈriː/, /ʃɑrˈkuːtəri/; French: [ʃaʁkytʁi], from chair ‘flesh’ and cuit ‘cooked’) is the branch of cooking devoted to prepared meat products such as bacon, ham, sausage, terrines, galantines, pâtés, and confit, primarily from pork. Charcuterie is part of the garde manger chef’s repertoire. Originally intended as a way to preserve meats before the advent of refrigeration, they are prepared today for their flavors derived from the preservation processes. Rhymes with CHARCUTERIE: Adar Sheni, advanced degree, Aegean Sea, Agri Dagi, alienee, Amundsen Sea, biographee, bouquet garni, carpenter bee, Caspian Sea, casus belli, charivari, chincherinchee, chinoiserie, consent decree, covenantee, cucumber tree, decision tree, dedicatee, delegatee, distributee, East China Sea, ESOP, evacuee, examinee, exuviae, facetiae, fait accompli, felo-de-se, fortunately, HTLV, interrogee, interviewee, jaborandi, Labrador Sea, millidegree, New Jersey tea, omega-3, Pasiphaë, patisserie, persecutee, poète maudit, prima facie, reliquiae, relocatee, Sault Sainte Marie, Simon Legree, skeleton key, South China Sea, to a degree, umbrella tree, wayfaring tree. You people are far more diabolical than I had previously feared. Sault Saint Marie? Loons. Son, we live in a world that has beer, and those beers have to be enjoyed by men with cheese. Who’s gonna do it? You? You, Ale Monger? I have a greater responsibility than you could possibly fathom. You weep for the lactose intolerant, and you curse the Cheese-makers. You have that luxury. You have the luxury of not knowing what I know. That cheese consumption, while tragic, probably made that beer taste better. And my existence, while grotesque and incomprehensible to you, made that beer taste better. You don’t want the truth because deep down in places you don’t talk about at parties, you want the cheese, you need the cheese. We use words like Cheddar, Gouda, Brie. We use these words as the backbone of a life spent enjoying food and beer. You use them as a punchline. I have neither the time nor the inclination to explain myself to a man who rises and sleeps under the blanket of the very flavor freedom that I provide, and then questions the manner in which I provide it. I would rather you just said thank you, and went on your way, Otherwise, I suggest you pick up a cheese wheel, and start slicing. Either way, I don’t give a damn how diabolical you think we are. Well said Wookie! I nearly spit up my coffee. You should be proud. To the Alemonger, I must apologize for the constant barrages of my cheese-minded cohorts. To Aaron Sorkin and the rest of “A Few Good Men”, I must apologize for the Wookie. To Russell Crowe and the rest of “Gladiator”, I again must apologize for the Wookie. However, apologies aside, I too nearly had a beverage pass through the nose and I am entertained. More creamy cheeses and charcuterie for all the men! Perhaps the first sign of Spring should be the return of the craft brew Neti Pot. The Rogue Dead Guy Ale version was quite painful, but nonetheless cleansing. Please, sir … more creamy cheeses and charcuterie for the booze dancers ….